FOR the expatriate community, the annual holidays are over. We have all undertaken the pilgrimage to and from our home countries. We have met family and friends. We have made memories and filled our suitcases with essentials, which we can but choose not to live without. It’s time to settle back into our Malaysian lives. Except, I’m not sure where home really is any more. I say, “I go home” when I fly out of Kuala Lumpur at the beginning of summer. But I also say it when I fly back to KL at the end of the holidays. Confusing, isn’t it? Schools are back in session. Work has piled up here in our absence. There are more than just a few uniquely Malaysian things that we missed while we were away. We are ready and a little anxious to get cracking at our daily routine. While we carefully unpack our loot, aka aforementioned “essentials”, (I tend to bring cheese and chocolate, lots of them. Others carry books, hair colour, cosmetics, even shoes and bras. Don’t ask! ), we look forward to all the experiences that make Malaysia feel like home. a list of occurrences every Malaysian has probably done at least once in their lifetime. While I can’t lay claim to every one of the 54 listed events, there are quite a few that my expatriate friends and I can relate to, quite a few that we look forward to. Number one on the list says “Complain about the weather”. So true! Even if the family back home thinks we have lost all common sense, we complain about the weather. It’s too hot, too humid, too hazy, raining, not raining. We miss the changing seasons. Sixteen positions on the said list are taken up by eating habits; no big surprise there. Even if we haven’t adopted every last one of the typically Malaysian culinary oddities (I still can’t sprinkle salt and pepper on my fruit, nor can I stand the smell of durian), we very much look forward to a taste of teh tarik and roti canai at the local mamak stall. Nasi lemak for breakfast, lunch and dinner, as well as in the wee hours of the morning after a long night out definitely makes Malaysia feel like home to us. 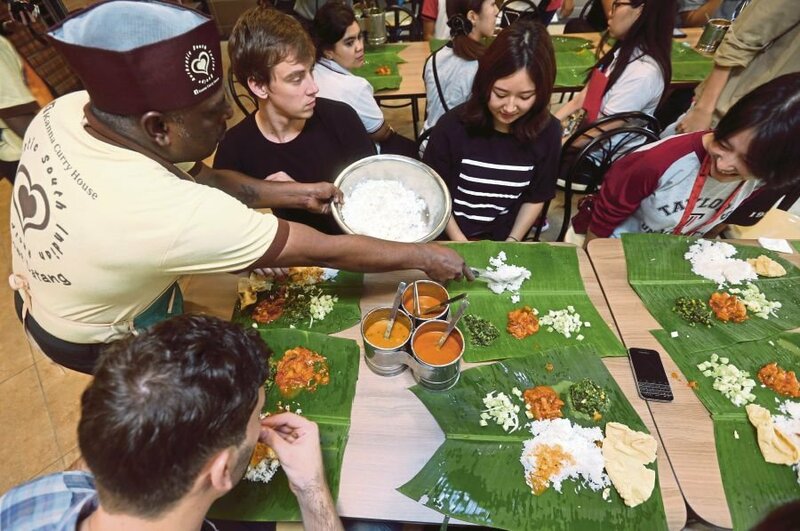 A hearty banana leaf meal eaten with our hands gives us the impression of belonging here, even if we often make a bigger mess of it than many locals do. The pasar malam is featured on this list. Roaming about such a market on a Sunday night, scouting for all sorts of random knick-knack, has become a ritual we didn’t know we missed while we were away for the summer. We would feel offended if mistaken for tourists in KL, so we are grateful for the local families taking pictures in front of the Petronas twin towers. If they do it, so can we. Our children share some uniquely Malaysian experiences with their local friends as well. Eating ABC (ais kacang) by the roadside, school trips to Petrosains and the batik factory, birthday parties at the fast food joint, vividly coloured birthday cakes, messing up the star while trying to draw the Malaysian flag, singing their little hearts out in a more or less accurate rendition of Rasa Sayang while dressed up in traditional attire, are fond childhood memories they will hold dear forever. The list goes on and on. But when we proudly introduce our visitors from overseas to roti tisu and miss Malaysian food when abroad, when we get invited to Raya open houses, when we are upset about the fact that friends back home can’t pinpoint Malaysia on a map and we become defensive as soon as a foreigner dares criticise Malaysia, we know for sure that a part of our heart will forever belong here in this country.